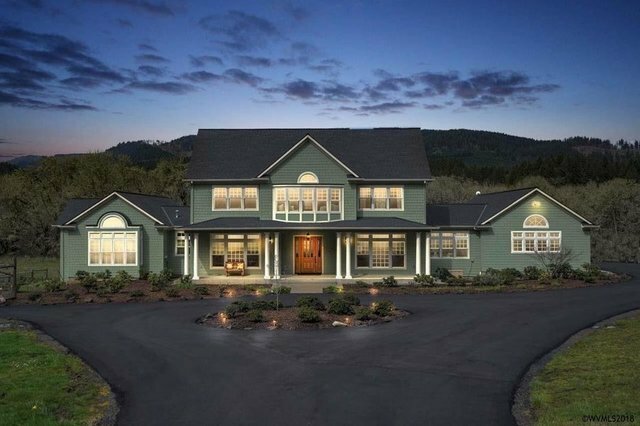 Enjoy tranquility on pristine retreat with captivating views and Soap Creek running through, near forest and trails and minutes to Corvallis. Custom designed and built by Chateau, this seven bedroom/seven half bathroom mansion boasts top-quality finishes in and out. Gourmet kitchen with Stainless Steel appliances, center island and butler's pantry, large living room with high ceilings and stonebake oven fireplace, huge family room with theater and bar. Two master suites on main and upper, 5+ more bedrooms/bathrooms. Efficient EFA with heat pump, finished 7+ car garage. Gardens and lawn with UGS, fenced/x-fenced pasture.